Heat oven to 350°F (325°F for dark or nonstick pan). Generously spray bottom only of 8- or 9-inch round cake pan with cooking spray (without flour). In large bowl, beat cake ingredients with electric mixer on low speed 30 seconds, then on medium speed 2 minutes, scraping bowl occasionally. Pour into pan. Bake 43 to 48 minutes or until toothpick inserted in center comes out clean. Cool 10 minutes. Run knife around edge of pan to loosen cake; remove from pan to cooling rack. Cool completely, about 1 hour. Meanwhile, in 1-quart heavy saucepan, mix sugar and cornstarch. Gradually stir in orange juice, 1/4 cup water and the egg yolks. Cook over medium heat, stirring constantly, until thickened. Cook and stir 1 minute longer. Remove from heat; stir in 2 tablespoons butter and the orange peel. Transfer filling to small bowl. Cover; refrigerate 30 minutes. In medium bowl, place chocolate. In 1-quart saucepan, heat whipping cream and 4 teaspoons butter over medium heat until butter melts and mixture boils. Pour cream mixture over chocolate; stir until smooth. Cool 10 minutes or until room temperature. Split cake horizontally to make 2 layers. On cut side of bottom layer, spread filling; cover with top layer. 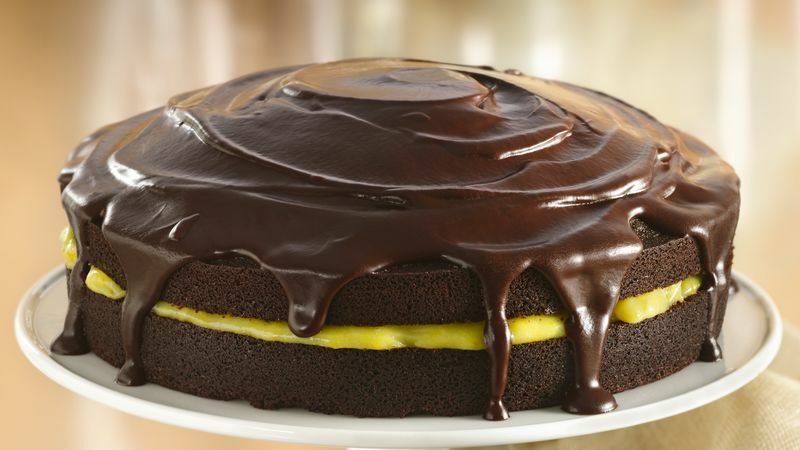 Pour glaze over top of cake; spread glaze to edge of cake and allow to drizzle down side of cake. Store in refrigerator. For a white chocolate glaze, substitute 6 oz white baking chocolate bars or squares for the semisweet chocolate. For a smooth filling, mix the sugar and cornstarch thoroughly before adding liquid. This keeps the cornstarch from developing lumps during cooking.